In 1929 a teacher in Waupaca asked her pupils what Wisconsinites did for winter sports. According to one newspaper, the children “with one accord all exclaimed: ‘They go to Wausau!’” In the 1920s, when Wisconsinites thought of winter sports, they thought of Wausau and its Winter Frolic. The Wausau Winter Frolic was a winter sports festival sponsored by the Wausau Outdoors Club and hosted by the entire community. The president and first vice president of the Wausau Outdoors Club, Cyrus Yawkey and D.C. Everest, respectively, were both prominent lumber businessmen, and most other organizers and judges from the club were connected to the logging industry. Like most other tourism efforts in the area during the 1920s, lumber business leaders funded, promoted, and managed the Winter Frolic. These businessmen knew that they were exhausting the lumber supply in the Northwoods, and worked as a group to reinvent the local economy. 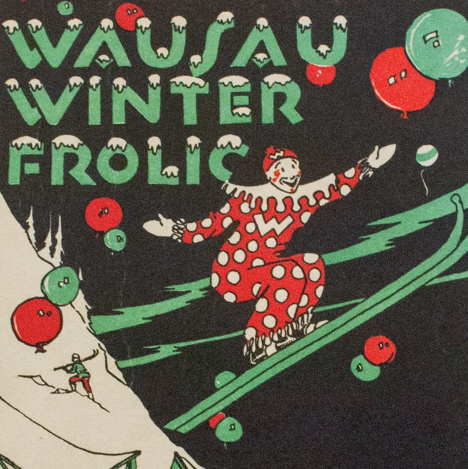 The Winter Frolics were a source of income and tourism for Wausau. More importantly, the Frolic brought the community together under a new identity as the winter sports capitol of the Midwest. The festival featured a variety of winter sports competitions and spectacles. These included skiing (cross country and alpine), hockey, skating (fancy, figure, and comic), horse racing on ice, tobogganing, curling, ski jumping, barrel jumping on skates, snowshoe racing, and broom ball. Notable athletes competed at the festival, including collegiate hockey teams from Marquette University, St. Thomas University, and the University of Minnesota. Most of the community was involved in the event. Storekeepers themed their window displays to advertise the Frolic and sold Frolic-themed garb. The festival was not limited to winter sports. It also included fireworks, parades, and elected a Frolic King and Queen. Local high school students were chosen for this honor from a court of nominees. On the afternoon of the coronation, the city would organize a parade through downtown. For the parade, many businesses and community organizations built floats. After the parade, the king and queen would be crowned and there was typically a ball for the community to celebrate and dance. In 1927, the community constructed a massive ice throne for the ceremony. In 1929, the Frolic King owned a ski plane and invited his Queen via a newspaper ad to fly over the city. As the lumber industry slowed, business leaders looked to turn northern Wisconsin into a winter sports destination. Image courtesy of the Wisconsin Historical Society, Image ID 3678. Though there were multiple attempts at revivals, Wausau no longer organizes an annual Winter Frolic. The Frolic lost momentum during the Great Depression, and again during World War II. During those periods, it was only hosted intermittently. Even as the Frolic dwindled, Wausau remained a hub for winter sports. Today, the town boasts large downhill skiing, cross-country skiing, ice skating, and curling facilities. Wausau also annually hosts the Badger State Winter Games, a massive winter sports competition of over twenty different sports categories. Though the Frolic did not last many years, the mission of establishing Wausau as one of Wisconsin’s winter sports capitals succeeded. “Flying Frolic King Invites Queen to Fly Over City,” Wausau Daily Record-Herald, Feb. 5, 1929. “Governor to Attend Frolic,” Wausau Daily Record-Herald, Feb. 5, 1929. Badger State Games, badgerstategames.org, accessed April 7, 2017. Object story created February, 2018. Previous post: What is a Point Blanket Coat?